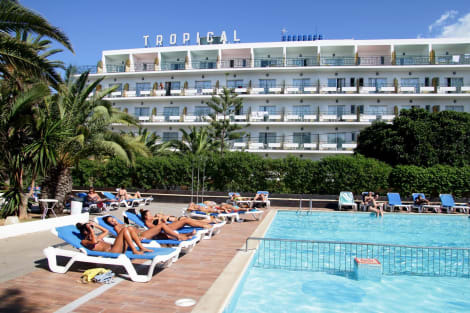 The Hotel Tropical Ibiza is found in the heart of San Antonio, just minutes’ walk from the town’s attractions, nightlife and public transport links. The hotel’s Chill pool area, with a snack bar and outdoor pool, is a great place to unwind, as is the fitness room, and you can enjoy the convenience of an on-site buffet restaurant and 24-hour reception. Each room is air conditioned and has free wi-fi access and satellite TV. Enjoy a meal at the restaurant or snacks in the hostal's coffee shop/café. Relax with your favorite drink at the bar/lounge or the poolside bar. The flats have a pool for adults with solarium and hammocks, an ideal area to enjoy summer days. The establishment offers also a porter service and room on courtesy. The reception is opened 24 hours a day and offers the possibility to buy tickets for night-clubs, excursions and sport activities The time to check-in is from 14h and the check-out is at 11h. The hotel has free wi-fi either in the bedrooms and in the hotel. Enjoy recreation amenities such as an outdoor pool or take in the view from a terrace. Additional amenities at this hotel include wireless Internet access (surcharge), tour/ticket assistance, and a reception hall. This wonderful beachside hotel enjoys an enviable situation in San Antonio, just a few minutes' walk from the city centre where a myriad of dining options, shops and entertainment venues are awaiting to be explored. The gorgeous white- sandy beach surrounded by the deep blue waters of the Mediterranean Sea is situated within a stone's throw from the property. Guests will be enchanted with hotel's cosy design, friendly and helpful staff and welcoming ambiance. The air-conditioned and en-suite rooms are bright and tastefully garnished to create a warm and relaxing atmosphere in which to totally relax at the end of the day. The snug units come with modern amenities to ensure a pleasant and truly comfortable stay. Travellers may lounge at the sun terrace and when hot, enjoy a refreshing drink from the bar or have a cooling dip in the sparking pool. Make yourself at home in one of the 52 air-conditioned guestrooms. Rooms have private balconies. Wireless Internet access (surcharge) is available to keep you connected. Bathrooms have bathtubs or showers and complimentary toiletries. When you stay at Ibiza Rocks BUDGET Apartments in Sant Antoni de Portmany, you'll be by the sea, within a 10-minute walk of Sunset Strip and Calo des Moro Beach. This apartment is 10.7 mi (17.2 km) from Port of Ibiza and 10.9 mi (17.6 km) from Talamanca Beach. Make yourself at home in one of the 89 air-conditioned rooms featuring flat-screen televisions. Complimentary wireless Internet access keeps you connected, and digital programming is available for your entertainment. Bathrooms with bathtubs or showers are provided. Conveniences include desks, and cribs/infant beds (complimentary) can be requested. Just 300 metres from the beach, the Hotel Playasol Marco Polo II is located in San Antonio’s centre, not far from some of the town’s most famous nightlife. The hotel has a games area, open-air pool, and a 24-hour reception service. Recently renovated in a contemporary style, rooms are furnished in a contemporary with free wi-fi, safes, air conditioning, plasma TVs and private bathrooms. lastminute.com has a fantastic range of hotels in Sant Antoni de Portmany, with everything from cheap hotels to luxurious five star accommodation available. We like to live up to our last minute name so remember you can book any one of our excellent Sant Antoni de Portmany hotels up until midnight and stay the same night.